Arches National Park, in case you haven't been following along, is one of my favorite places. Just a few minutes north of the town of Moab, Utah, it's kind of small as far as National Parks go. From the single entrance station, it's not quite a 20 mile drive to the Devils Garden campground and trailhead at road's end on the north end of the park. There's only one way in and out on paved roads, if you don't mind a sandy 4x4 road there's a couple other ways too. Most of the popular features of the park are also very accessible for most people, close to the main roads or not far off them. In recent years, as the popularity and visitation of the park have soared, this has created problems with overcrowding of parking lots, overlooks, and trails within the park. The single entrance road can get backed up all the way out to the highway, which has contributed to a stop light being put in at that intersection recently. There's so much to see packed into a relatively small area, and park facilities designed to serve far fewer people are being stretched to the limit. 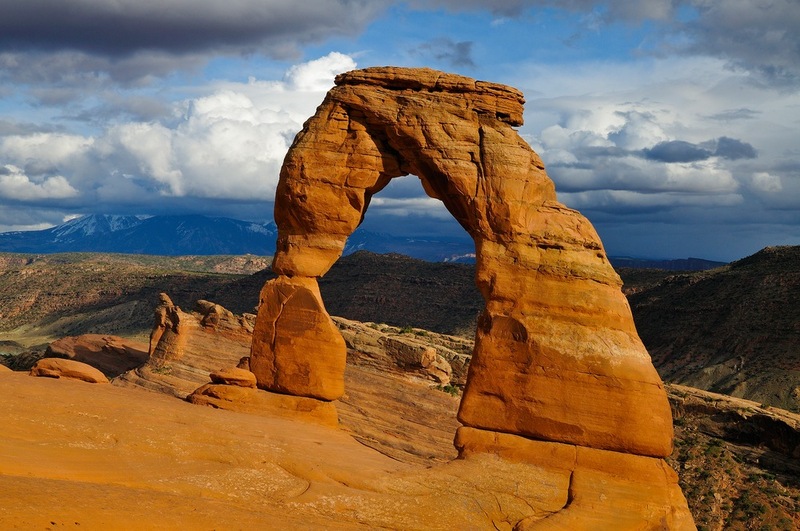 So what do you do to see all the amazing sights that Arches has to offer, while staying out of the crowds. The first steps are common anywhere. Get ahead of the tourists by coming early, there's so many amazing places to see that sunrise light hit these red rocks that it would be a shame to miss it. While you'll see other photographers out and about, you should have plenty of elbow room to choose your spot, and there are plenty to choose from. Some of my favorite sunrise spots are in the Courthouse Towers area, the Windows, and most of the arches in the Devils Garden area. The opposite side of that is to come later in the day and stay for sunset. 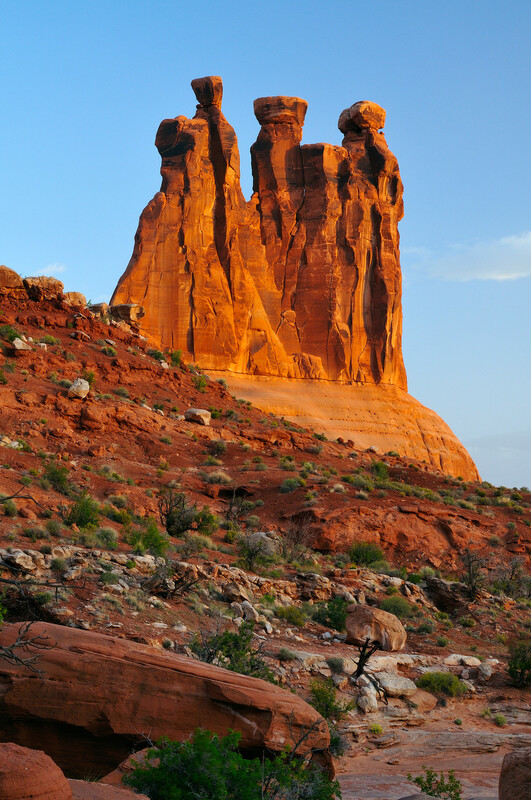 Sunset light on Balanced Rock, the Windows again, Delicate Arch, and the Fiery Furnace is spectacular as well. Being out and about in the heat of the day during the summer is not to be advised anyway, with temperatures over 100 degrees being common in June, July, and August. Also, visiting on a weekday will lessen the crowds somewhat, although during the most popular times it's only going to help so much. The next best solution, although the options are more limited at Arches, is to get out on those hiking trails. The most popular ones lead to the two landmarks that Arches is known for. One is Delicate Arch. Everybody knows this arch, even if they don't know that this is where it's at. It's on the Utah license plate, it's on the Welcome to Utah signs when you enter the state, and it's a landmark of the entire park system. While the hike to reach it is only 3 miles round trip, it's not easy. You gain 700 feet on your way up, and you must navigate over a lot of open slickrock terrain. But when you round that final corner and the arch comes into view, it's breathtaking. The late afternoon/sunset light is prime, but it's a beautiful spot any time of day. 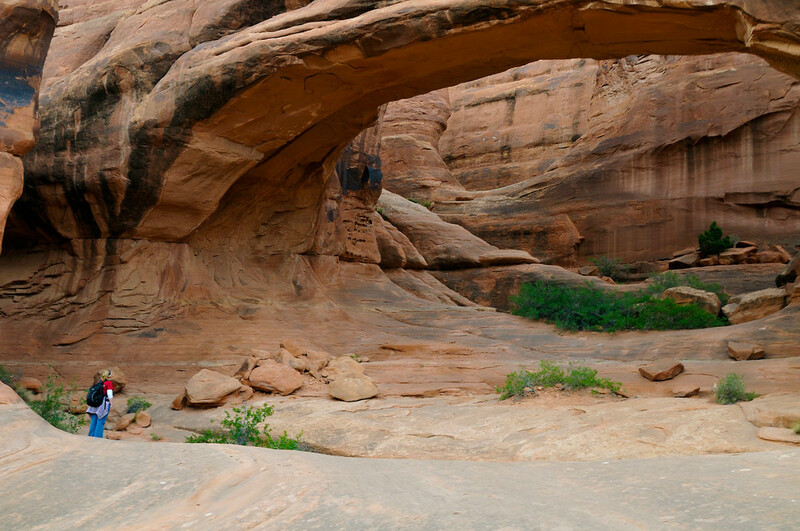 The second most popular hike is to take the Devils Garden trail as far as Landscape Arch. With a length of over 300 feet (longer than a football field! ), it is one of the longest arch spans in the world. This hike is only around 2 miles round trip, and much easier than Delicate Arch. Landscape looks as if it might come down at any time, and in reality it could. Just beyond it on the trail there used to be an arch called Wall Arch. I saw it on my first visit to the park back in 2003. But during the night of August 4, 2008, the entire arch came crashing down. In a park with over 2000 arches created by natural forces, the reality is that any of them could fall at any time. I know what you're saying now though. "Everybody does those hikes, they'll be crowded too." And that's not entirely wrong. If you keep going on the Devils Garden trail though, past Landscape Arch you'll find that the crowds start melting away the farther you go, and the sights just get better and better. Continuing all the way back to Double O arch brings you to a really unique formation, one that you'll be glad you made the effort to see. From there, return on the Devils Garden Primitive Loop, and you'll wind your way back through the sandstone fins on a truly unique adventure. If you see all the sights along the trails, including all the spurs off to the various arches, this is a full half-day or more adventure. It's a great way to see more of Arches than the average visitor. Arches doesn't have a lot of truly backcountry areas, but if youi're willing to venture out on the dirt and 4x4 roads you can visit an area that truly fits that description. The Klondike Bluffs area, in the far northwest of the park, is a place where you truly will find solitude. On our visit we drove the 4x4 roads out there, and met no one else along the way, even in the prime season of May. The Klondike Bluffs is where you will find the Marching Men formation, and it also hides the spectacular Tower Arch. If you're brave enough to drive the 4x4 road you'll be rewarded with some very beautiful terran on your drive south from the Klondike Bluffs as well. The views are impressive, the road is an adventure, and you'll probably have it all to yourself. One last way to find solitude in Arches, although more and more people are doing it all the time, is to visit the park at night. Night hikes to the popular destinations can give a whole different perspective, and being hundreds of miles from any major city means that the night skies are exceptionally dark. Night photography opportunities here are amazing when the weather is your friend, and Arches is an exceptional place to do it. The quiet of this landscape at night, especially compared to those daytime crowds, is really amazing. The unique beauty of Arches National Park is something I love, and its accessibility means I recommend it to anyone who's thinking about visiting. I hope some of my suggestions will bring more depth to your visit, and make it a more enjoyable one too. This is part of a series I'm doing on National Parks and some of my favorite spots in each one I'm featuring, in honor of National Parks Week. I hope you'll take a peek at my National Parks Gallery as well while you're here! 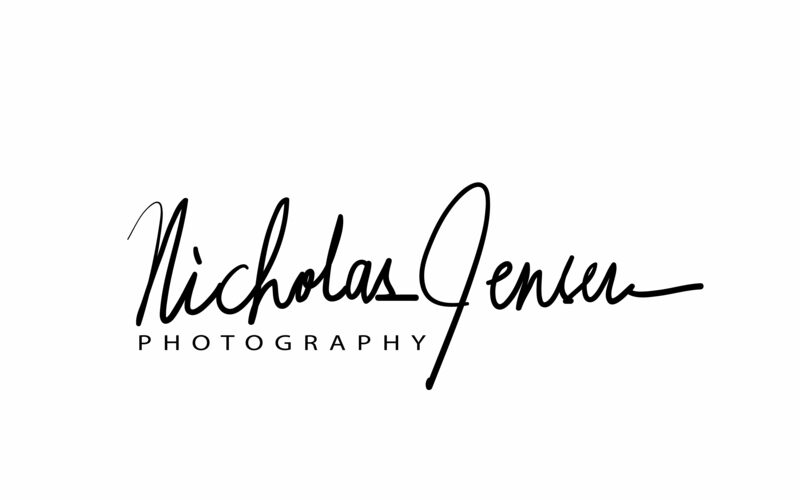 If you're enjoying following my posts here on my blog, don't forget to follow me on Facebook & Instagram as well. You'll often see my latest photos there first! If you'd like to order a print of these photos, just click on them and you'll be taken to my art store where you can place your order. Thanks for following along!